When I get invited to a potluck or dinner at a friend’s place, it pretty much goes without saying that I’m the one responsible for bringing dessert. And more often than not, my dessert of choice is cookies. They’re easily portable, I can prep the dough ahead of time, and they don’t require any fuss (plates, utensils, etc.) on location. I take a certain amount of pride in the fact that they’re always a hit, regardless of whether the other guests are gluten-free or not. But there’s always a faction of people that leave me totally exasperated: the people don’t like sweets and avoid the dessert altogether. As somebody with a major sweet tooth, the whole not liking sweets phenomenon is outside my realm of comprehension. But it seems like there are plenty of these folks out there, lurking in the shadows. Perhaps one of your loved ones or co-workers is afflicted? 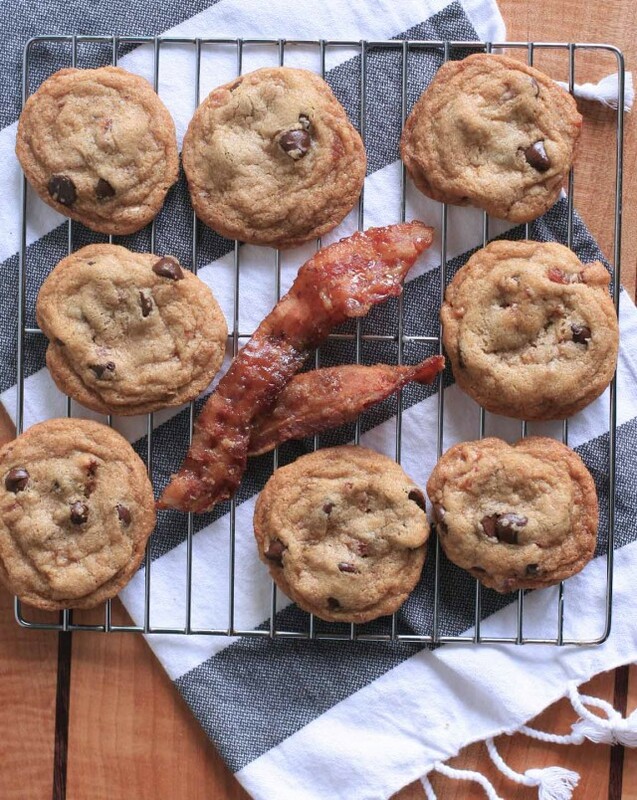 These candied bacon chocolate chip cookies are my strategy in curing those seemingly odd ducks. 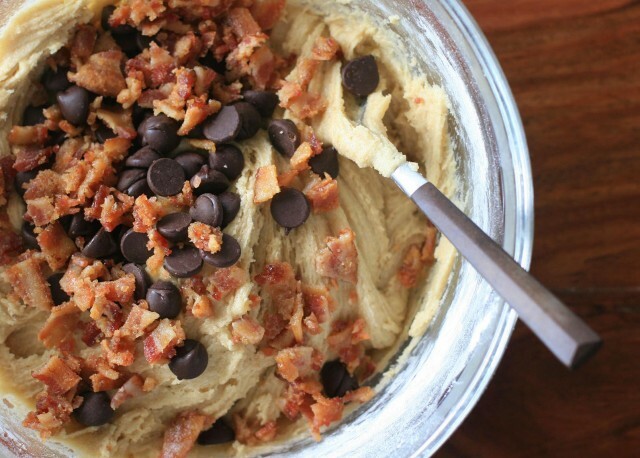 The cookie dough is made with butter and bacon grease, which infuses every bite with a faint porky, savory goodness. 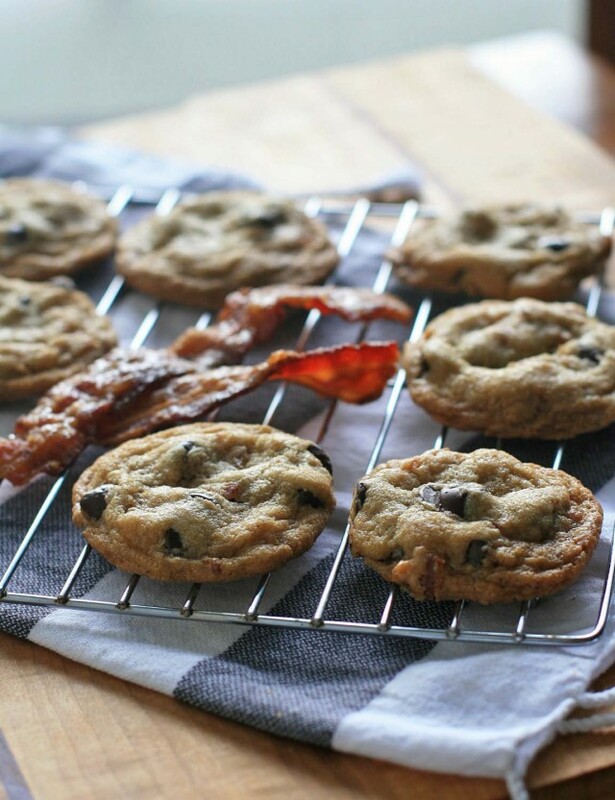 And plenty of candied bacon is mixed in along with a generous amount of chocolate chips. Even those who claimed to not like sweets were intrigued enough to give them a try. And you know what? I saw them returning for thirds and fourths. Mission accomplished. Preheat oven to 375 degrees. 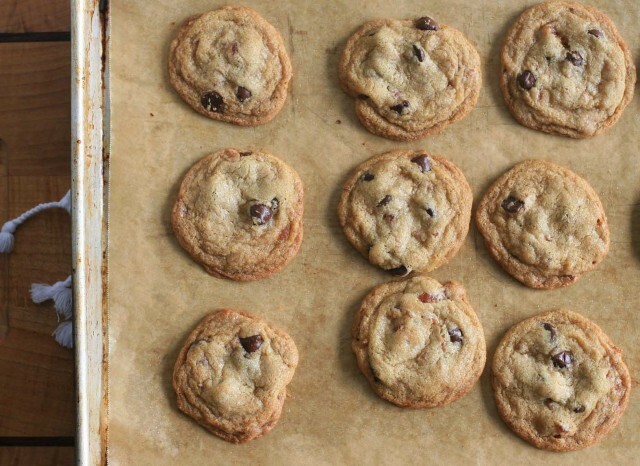 Lightly grease a cookie sheet or line with a Silpat baking mat. Beat butter, bacon grease and sugars until well combined. Add the eggs and vanilla extract and mix until smooth. Add the rice flour, potato starch, sorghum flour, baking soda, xanthan gum and salt and mix until thoroughly combined. Add the chocolate chips and candied bacon pieces and stir until well incorporated. 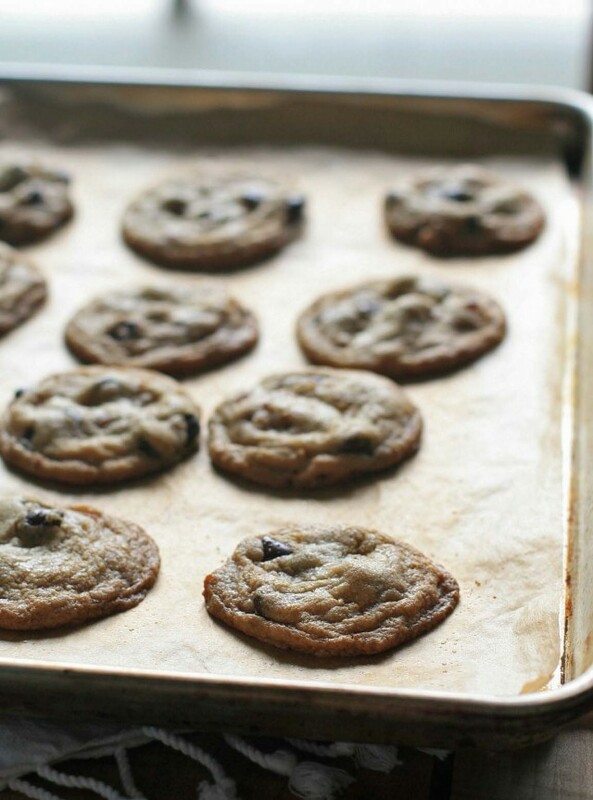 Drop heaping teaspoons of dough onto the cookie sheet. Bake for 10-12 minutes, or until the edges turn a light golden brown. Let cool for a minute or two on the cookie sheet and then transfer to a wire rack to cool completely.